See some ACTION PHOTOS at the bottom of this page! Includes the award by Arnold Schwarzenegger to a jubilant (and newly engaged) Poundstone. USA's Phil Pfister is pictured below right. More photos at the bottom. This DVD is a “must have” for all fans of Strongman Contests, and fans of these amazing strongmen and their incredible feats of power and strength. 2. Zydrunas Savickas - Lithuania. 5. The Circus Dumbell - Contestants will lift a replica of a "Circus" dumbbell, which were used by professional Strongmen from the early 20th century. The dumbbell weighs 202 lbs. and has a very big handle which is 3 inches in diameter. The men will use one hand at a time and lift the dumbbell overhead as many times as possible in 90 sec. This year, in addition to the Arnold Strongman Classic's traditional tests of total body strength, there was an entirely new feature for the crowds at the Arnold Fitness EXPO. This new feature, "Mighty Mitts," was sponsored by MHP, and it did not involve the Arnold Strongman competitors. Instead, it showcase ten men who are world-famous for the strength of their hands. The Grip Giants who have been selected to take part in this event are the very best in the world. It will be an extra attraction for fans of Strongman contests as well as for aficionados of "grip feats." These men faced four challenges with $1,000 per event on offer. In our Extra Scenes we have included the 2 most visually exciting events, The Jowett Anvil and Sorin’s Monster. These challenges took place on the Expo Stage before and after the Strongman events. It weighs approximately 163 pounds and will be placed on the platform with its horn pointing upward. The challenge will be to simply grasp it by the horn with either hand, lift it off the ground and walk/run as far as possible forth and back across the front part of the 50' stage within 30 seconds. The prize-money ($1000) will go to the man who carries it the greatest distance. Only chalk will be allowed for this challenge and for all others. Richard Sorin, founder and owner of the Sorinex Equipment Company and himself one of the legends of hand strength, will provide a huge, circus-type barbell weighing approximately 500 pounds and featuring a bar two inches in diameter; this bar will not rotate within the spheres in any way. The challenge will be to deadlift the bar for as many repetitions as possible within 30 seconds using a double-overhand (pronated) grip. Sumo and traditional deadlifting styles are both permitted and the bell may be "hitched" on the way up as long as the lifter is standing straight at the end of the lift. The barbell will have to touch the platform on every rep after the referee has given the "Down" signal, and a "hook grip" will not be allowed. A contestant may put the barbell down between reps if he likes, or he may simply touch the platform before making another attempt to deadlift it. If no one deadlifts the Monster, the prize-money will be given to the man who pulls the bar the greatest distance off the platform, and if more than one person makes at least one successful lift and there is a tie in the number of reps the prize-money will be split. Rich Williams won all 3 events. None of the competitors in the 2010 Mighty Mitts competition were able to lift the Mark Henry bell out of the box. Jim Lorimer refers to the Arnold Sports Festival as "Strength Heaven," and the introduction of these unprecedented grip challenges has added a new attraction as well as a new dimension to the festival - an attraction which should stimulate strong men everywhere to push back the boundaries of hand strength. Please also see STRONGMAN BATTLES OF STRENGTH, V-206DVD. Please also see THE DAVID WEBSTER STRONGMAN COLLECTION, GMV-206DVD. 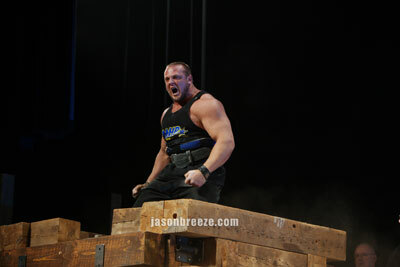 Please also see highlights from the 2002 ARNOLD STRONGMAN CLASSIC, GMV-469DVD. Please also see THE MIKE DAYTON STRENGTH SHOW, GMV-008DVD. 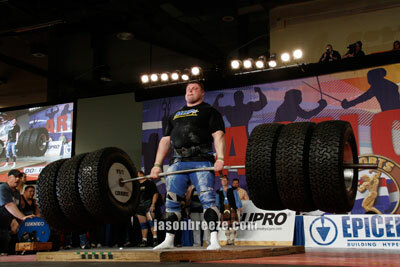 Please also see BRUTE FORCE AT THE 2006 FITEXPO, V-202DVD. Please also see LARGER THAN LIFE - JON PALL SIGMARSSON, A-1258DVD. Please also see GRUDGE MATCH: GERMANY v USA - POWERLIFTING, GMV-226DVD. Please also see PAUL ANDERSON - STRONGEST MAN IN RECORDED HISTORY, A-5618DVD. Please also see POWER & STRENGTH '95, GMV-205DVD. Please also see the 2008 ARNOLD STRONGMAN CLASSIC, GMV-700DVD. 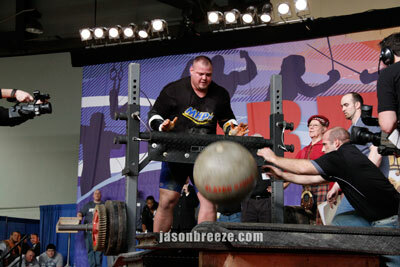 Please also see the 2009 ARNOLD STRONGMAN CLASSIC, GMV-755DVD.